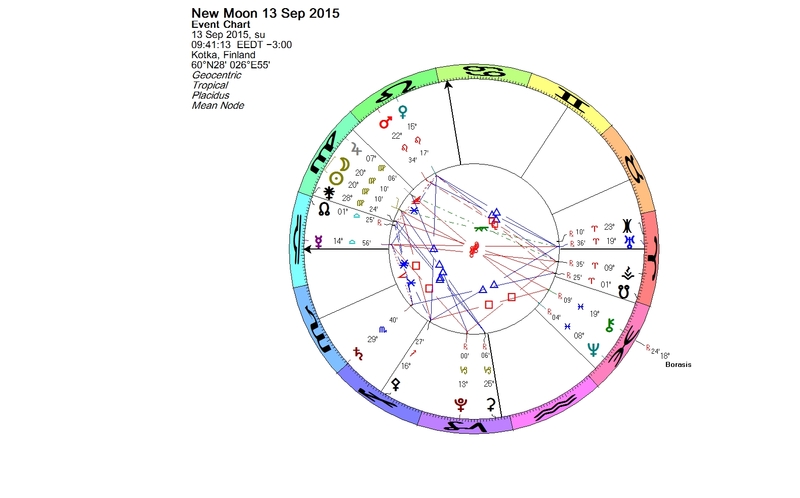 The New Moon in Virgo on Sept. 13 was a partial solar eclipse. Eclipses are more powerful than ordinary New Moons. In astrology, even if the eclipse is not visible where you live, it has an impact nevertheless. Eclipses are the emissaries of change. In the eclipse chart in Pisces opposite the luminaries was Chiron. Chiron has affinities with Virgo, some astrologers even consider it to be the ruler of the sign. The symbol of the earth sign Virgo is a maiden. The natives born in this sign are often practical, dependable and strongly inclined to serve their human fellows. The sign is associated with the sixth house, where matters of health, service and daily work belong. Virgo represents nurses, cleaners, servants and laborers. There are going to be a massive demonstration and strikes in Finland on Friday. We haven’t seen anything like it since the general strike in 1956. The demonstration will close harbors and cause cancellations of flights. Policemen, bus drivers, teachers, shop personnel, health care workers etc., everybody is protesting. The whole labor union movement is prepared to show its power. The demonstration is aimed against the centre-right government’s cuts, which will affect mostly women in low paid branches and those working in the public sector. The cuts treat people unjustly. According to the Finnish Broadcasting Company Yle calculations, midwives are losing most. Yes, that’s right, the midwives have to bear the heaviest burden and save Finland! The government is also restricting the right to agree on terms of employment and wrecking the policy of consensus, a process of decision-making that seeks widespread agreement among group members. So far employers, trade unions and the government have been able to negotiate the terms themselves, rather than the terms being imposed by law. In Pisces, opposite the solar eclipse and in conjunction with Chiron is Borasisi, a minor planet in the Kuiper belt region. The name comes from Kurt Vonnegut’s novel Cat’s Cradle. In the novel, the fictional religion of Bokononism is based on lies. One who believes harmless untruths will have peace of mind and a happy life. Borasisi’s presence could refer to some people’s difficulty to accept the urgent need to make economical adjustments in Finland. People want to believe that everything is fine. On the other hand, it may refer to some people’s willingness to believe that the government’s acts will get us safe. There are many who don’t believe so, as Friday’s demonstration shows. Mercury in the mid-degrees of Libra has turned retrograde on Thursday. 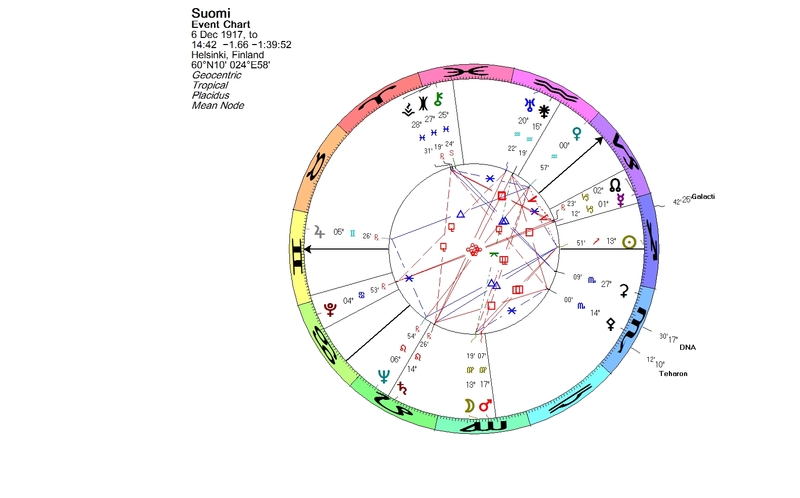 It aspects several planets in Finland’s birth chart: Saturn in Leo, the Moon-Mars conjunction in Virgo, Pallas in Scorpio, the Sun in Sagittarius, and Juno in Aquarius. It is commonly known, that Mercury retrograde can cause confusion and complicate communication. Signing contracts is not recommendable under this influence. This is not promising any easy negotiations or quick solutions here in Finland. This entry was posted on Thursday, September 17th, 2015 at 10:18 pm	and is filed under Eclipses, Mercury station, New Moon. You can follow any responses to this entry through the RSS 2.0 feed. You can leave a response, or trackback from your own site.